This little vehicle is the one we'd all prefer never to use: the bier to carry the coffin to the graveyard. It is a hand cart with wire wheels. 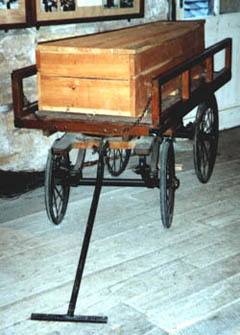 The child-sized coffin on top was added during the filming of scenes from "Jane Eyre" on location at Dalemain by London Weekend TV. This bier would only have been of use in a town or village where the roads were made-up of levelled stone, and the burial ground and church were close by the deceased's home. Where families lived in remote dales,the coffin would be strapped onto the back of a pony and carried over several miles of rough going to be buried. One such "Corpse Road" ran over from Mardale to Shap, where the church was established in Norman times on a possible earlier site. The road was in use until Mardale's own church and burial ground were consecrated.